Fitness trackers have added all sorts of new features, such as heart rate monitoring and GPS, over the past few years. But both Fitbit and Misfit know that when it comes to untapped customers, it pays to keep things simple. These two trackers don't add much in terms of features from their predecessors. What we get instead is two redesigned form factors that mean these trackers are more stylish and unobtrusive than ever before. They are both aimed simply at people who want to increase their daily steps or calories burned to feel a bit better. Nothing more complicated than that. (If you want more fitness features, check out the new Fitbit Alta HR). Now we've reviewed both, we know that both accomplish that aim but there's pros and cons of choosing both of these far from perfect devices. Here's how the Misfit Ray and Fitbit Alta compare in terms of design, tracking, apps, battery life and - of course - price. Both are on sale now. Neither the Fitbit's or the Misfit's design will embarrass you. Essentially, the Misfit cylinder is the smaller, sleeker and slightly more comfortable of the two as the default package but the Fitbit already provides better customisation thanks to both leather and stainless steel accessories with more designer collaborations coming soon. Misfit has a ton of new bands so that levels things out on the customisation front. The main difference between the two overall (not just in design) is that the only sign that the Misfit Ray is connected is the single multicoloured LED on the top edge whereas the Alta is rocking a small, 1.4-inch OLED screen. The screen or no screen decision is the main one you have to make here as it impacts on alerts features and battery life which vary between these two trackers. The 15mm wide Fitbit Alta comes in two sizes whereas the 12mm wide Ray only appears to come in one, dainty size for now. Both clasps are easy enough to get on with both can be worn with mechanical or smartwatches thanks to their skinny designs. Though it's bigger and weighs slightly more than the Ray, the Alta's curved body keeps it from getting annoying and we haven't had any rash problems so far. The Misfit has another advantage here, at least for swimmers - it's water resistant to 50m whereas the Fitbit is described as splash/rain/sweatproof. When we wore the Alta and the Ray together (both on wrist), we found that Fitbit's tracker tends to slightly overestimate our daily step count whereas if anything, Misfit errs the other way. The most important thing is that it's consistent and you get a sense of your progress which both Fitbit and Misfit apps provide. Away from counting steps, Misfit's tracker can now also offer basic swim tracking data via an in-app purchase. It's the very same swim features packed into the Speedo Shine 2 letting you count laps and track distance in the pool. In terms of motivation (though badges) and community, we'd firmly pick Fitbit right now but fitness apps are always improving and you may prefer the simplicity of Misfit's 'stories'. Fitbit's app is super easy to use for beginners, too, though and the one we'd recommend plus you can log food and water, not just weight, inside the app which is handy. Is the most expensive Mi Band yet worth it? We had a few problems pairing and syncing the Ray with our Android phone as well as setting up the Alta on iOS so this still remains a hit and miss set up experience across platforms which is a pain. On the sleep side of tracking, we found the Misfit Ray to be generally more accurate at sleep and awake times and also providing more detailed (though as yet unverified) data on light and deep sleep. The Alta can be annoying when worn to bed, too, as the display can auto switch on and off throughout the night. Fitbit has a Sleep Schedule mode, which does mean you can take better control of how much pillow time you get each night. 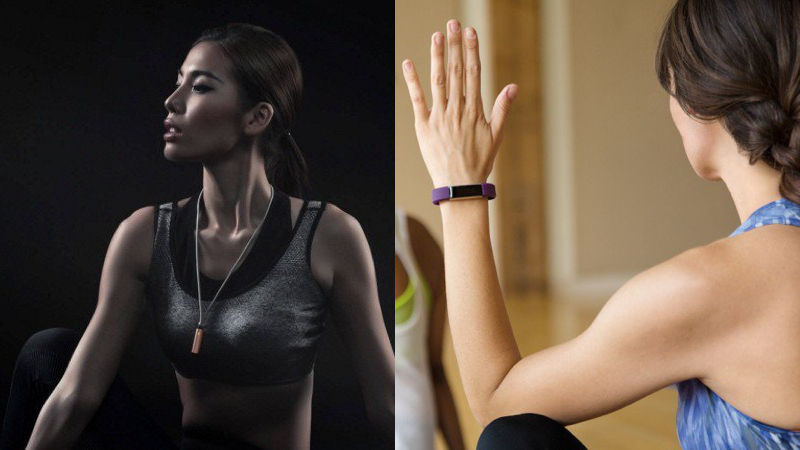 Both these trackers offer extra features that go beyond fitness. Which is best depends what you care about. Though the Alta's screen is always off, it is better for telling the time and seeing call, calendar and text notifications (no third party yet) due to the fact it has a display at all. The Ray handles call and text alerts too but will only blink its LED at you and rely on your remembering which colour is which. Misfit's secret weapon is that with the additional Link app you can turn the Ray into a smart home button to control music and smart bulbs from your wrist. In practice, if you want to see your activity progress, though, this is limited to one set feature at a time. Both trackers feature smart alarms. A comfortable win for the Misfit Ray with its up to six months battery life - it stayed at 'fully charged' during the two to three weeks we were testing it. This is a no charging wearable, a real appeal. It also uses two button cell batteries which are cheap and straightforward to replace. The Fitbit Alta, on the other hand, officially lasts at least five days. This will depend on how much you use it but our US editor Lily managed to get eight days out of her Alta, impressive. In short, you should be able to get away with charging your Alta once every week or so. That we can live with though the fact it uses a proprietary charger is pretty annoying. The Fitbit Alta is the slightly more expensive of the two trackers at $125 in the US and £99.99 in the UK. The Misfit Ray meanwhile is £79.99 like the Shine 2. Misfit's accessories are cheaper too - if you'd prefer a leather band over the sport band, it's $119 for a Ray and Misfit has just launched a whole bunch of bands. Fitbit's leather accessories cost an extra £49.99 with a stainless steel option available for £79.99 and more premium Public School and Tory Burch accessories. Many of the differences between the Misfit Ray and Fitbit Alta are dealbreakers. If its meaningful fitness improvements you're after, choose Fitbit for its app with the warning that it may sometimes overestimate steps. If you want to save some money or you hate charging, it's the Misfit. Swimmers, again, choose the Misfit Ray. Likewise, if sleep tracking is important to you. Or if you're looking to customise your tracker to make it look more like jewellery, stick with the Alta which has a number of collaborations on the horizon. What we have here is two easy to live with trackers that add a few extra features without turning either into a smartwatch rival. Let us know whether you've chosen the Fitbit Alta or the Misfit Ray in the comments.